A couple weeks ago I shared how Amazon got me to buy a book with an email. I’m so glad they did. I loved this book! I’m already halfway through my second reading. This time with highlighter in hand. 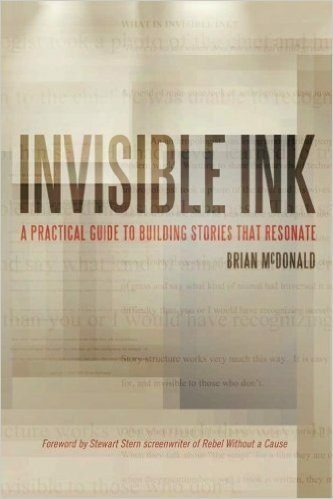 Invisible Ink: A Practical Guide to Building Stories That Resonate is actually a book written for fiction writing — mostly screenplays. But I read it with an eye for copywriting. It all applies. Plus what I learned in this book is going to make me a more engaged movie watcher. Super interesting. I learned some new terms and ideas here. But mostly I got a really good overview of how to craft a story. Invisible Ink refers to the things that aren’t said implicitly in your writing. Or the things that are said but in a subtle way that lets your reader’s brain connect the dots. It’s what great writers use to make their stories more than just a reciting of facts and events. I’m a big believer in having a goal for every email written. I’m glad to see that this book spent a good deal of time on that idea. Brian calls it the Armature. It’s the idea upon which the story hangs. His points got me thinking about how I’m going to approach writing copy in the future. I think I’m going to spend more time digging into my armature. What’s the single idea I’m trying to convey? Anyway, I highly recommend this book. Especially if, like me, you’ve read every copywriting book out there and are sick to death of them. This is a totally refreshing approach.